1 A None No Power Seat 1 A is a standard First Class seat that has limited legroom due to the position of the bulkhead. 1 B None No Power Seat 1 B is a standard First Class seat that has limited legroom due to the position of the bulkhead. 1 C None No Power Seat 1 C is a standard First Class seat that has limited legroom due to the position of the bulkhead. 1 D None No Power Seat 1 D is a standard First Class seat that has limited legroom due to the position of the bulkhead. 10 A None No Power Seat 10 A is a standard Delta Comfort+ seat that may have some extra legroom as there is no bulkhead wall, just a curtain divider. 10 B None No Power Seat 10 B is a standard Delta Comfort+ seat that may have some extra legroom as there is no bulkhead wall, just a curtain divider. 10 C None No Power Seat 10 C is a standard Delta Comfort+ seat that may have some extra legroom as there is no bulkhead wall, just a curtain divider. 10 D None No Power Seat 10 D is a standard Delta Comfort+ seat that may have some extra legroom as there is no bulkhead wall, just a curtain divider. 10 E None No Power Seat 10 E is a standard Delta Comfort+ seat that may have some extra legroom as there is no bulkhead wall, just a curtain divider. 10 F None No Power Seat 10 F is a standard Delta Comfort+ seat that may have some extra legroom as there is no bulkhead wall, just a curtain divider. 11 F None No Power Seat 11 F is a standard Delta Comfort+ seat. 12 F None No Power Seat 12 F is a standard Delta Comfort+ seat. 13 A None No Power Seat 13 A is a standard Economy Class seat. Delta designates this seat as a Preferred Seat, which is reserved for Delta Medallion members. This seat may be selected by Medallion members at time of booking or afterwards. This seat becomes available to all passengers at time of check-in. 13 D None No Power Seat 13 D is a standard Economy Class seat. Delta designates this seat as a Preferred Seat, which is reserved for Delta Medallion members. This seat may be selected by Medallion members at time of booking or afterwards. This seat becomes available to all passengers at time of check-in. 13 F None No Power Seat 13 F is a standard Economy Class seat. Delta designates this seat as a Preferred Seat, which is reserved for Delta Medallion members. This seat may be selected by Medallion members at time of booking or afterwards. This seat becomes available to all passengers at time of check-in. 14 A None No Power Seat 14 A is a standard Economy Class seat that has limited recline due to the exit row behind. Delta designates this seat as a Preferred Seat, which is reserved for Delta Medallion members. This seat may be selected by Medallion members at time of booking or afterwards. This seat becomes available to all passengers at time of check-in. 14 C None No Power Seat 14 C is a standard Economy Class seat that has limited recline due to the exit row behind. Delta designates this seat as a Preferred Seat, which is reserved for Delta Medallion members. This seat may be selected by Medallion members at time of booking or afterwards. This seat becomes available to all passengers at time of check-in. 14 D None No Power Seat 14 D is a standard Economy Class seat that has limited recline due to the exit row behind. Delta designates this seat as a Preferred Seat, which is reserved for Delta Medallion members. This seat may be selected by Medallion members at time of booking or afterwards. This seat becomes available to all passengers at time of check-in. 14 F None No Power Seat 14 F is a standard Economy Class seat that has limited recline due to the exit row behind. Delta designates this seat as a Preferred Seat, which is reserved for Delta Medallion members. This seat may be selected by Medallion members at time of booking or afterwards. This seat becomes available to all passengers at time of check-in. 15 A None No Power Seat 15 A is a standard Economy Class seat that has extra legroom due to the exit in front however, also has limited recline due to the exit row behind. Delta designates this seat as a Preferred Seat, which is reserved for Delta Medallion members. This seat may be selected by Medallion members at time of booking or afterwards. This seat becomes available to all passengers at time of check-in. 15 B None No Power Seat 15 B is a standard Economy Class seat that has extra legroom due to the exit in front however, also has limited recline due to the exit row behind. Delta designates this seat as a Preferred Seat, which is reserved for Delta Medallion members. This seat may be selected by Medallion members at time of booking or afterwards. This seat becomes available to all passengers at time of check-in. 15 C None No Power Seat 15 C is a standard Economy Class seat that has extra legroom due to the exit in front however, also has limited recline due to the exit row behind. Delta designates this seat as a Preferred Seat, which is reserved for Delta Medallion members. This seat may be selected by Medallion members at time of booking or afterwards. This seat becomes available to all passengers at time of check-in. 15 D None No Power Seat 15 D is a standard Economy Class seat that has extra legroom due to the exit in front however, also has limited recline due to the exit row behind. Delta designates this seat as a Preferred Seat, which is reserved for Delta Medallion members. This seat may be selected by Medallion members at time of booking or afterwards. This seat becomes available to all passengers at time of check-in. 15 E None No Power Seat 15 E is a standard Economy Class seat that has extra legroom due to the exit in front however, also has limited recline due to the exit row behind. Delta designates this seat as a Preferred Seat, which is reserved for Delta Medallion members. This seat may be selected by Medallion members at time of booking or afterwards. This seat becomes available to all passengers at time of check-in. 15 F None No Power Seat 15 F is a standard Economy Class seat that has extra legroom due to the exit in front however, also has limited recline due to the exit row behind. Delta designates this seat as a Preferred Seat, which is reserved for Delta Medallion members. This seat may be selected by Medallion members at time of booking or afterwards. This seat becomes available to all passengers at time of check-in. 16 A None No Power Seat 16 A is a standard Economy Class seat that has extra legroom due to the exit. Delta designates this seat as a Preferred Seat, which is reserved for Delta Medallion members. This seat may be selected by Medallion members at time of booking or afterwards. This seat becomes available to all passengers at time of check-in. 16 B None No Power Seat 16 B is a standard Economy Class seat that has extra legroom due to the exit. Delta designates this seat as a Preferred Seat, which is reserved for Delta Medallion members. This seat may be selected by Medallion members at time of booking or afterwards. This seat becomes available to all passengers at time of check-in. 16 C None No Power Seat 16 C is a standard Economy Class seat that has extra legroom due to the exit. Delta designates this seat as a Preferred Seat, which is reserved for Delta Medallion members. This seat may be selected by Medallion members at time of booking or afterwards. This seat becomes available to all passengers at time of check-in. 16 D None No Power Seat 16 D is a standard Economy Class seat that has extra legroom due to the exit. Delta designates this seat as a Preferred Seat, which is reserved for Delta Medallion members. This seat may be selected by Medallion members at time of booking or afterwards. This seat becomes available to all passengers at time of check-in. 16 E None No Power Seat 16 E is a standard Economy Class seat that has extra legroom due to the exit. Delta designates this seat as a Preferred Seat, which is reserved for Delta Medallion members. This seat may be selected by Medallion members at time of booking or afterwards. This seat becomes available to all passengers at time of check-in. 16 F None No Power Seat 16 F is a standard Economy Class seat that has extra legroom due to the exit. Delta designates this seat as a Preferred Seat, which is reserved for Delta Medallion members. This seat may be selected by Medallion members at time of booking or afterwards. This seat becomes available to all passengers at time of check-in. 17 F None No Power Seat 17 F is a standard Economy Class seat. Delta designates this seat as a Preferred Seat, which is reserved for Delta Medallion members. This seat may be selected by Medallion members at time of booking or afterwards. This seat becomes available to all passengers at time of check-in. 32 C None No Power Seat 32 C is a standard Economy Class seat however, the proximity to the lavatories and galley may be bothersome. 32 D None No Power Seat 32 D is a standard Economy Class seat however, the proximity to the lavatories and galley may be bothersome. 32 F None No Power Seat 32 F is a standard Economy Class seat that is missing a window. 33 A None No Power Seat 33 A is a standard Economy Class seat in the last row of the aircraft that may have limited recline. The proximity to the lavatories and galley may be bothersome. This seat is missing a window. 33 B None No Power Seat 33 B is a standard Economy Class seat in the last row of the aircraft that may have limited recline. The proximity to the lavatories and galley may be bothersome. 33 C None No Power Seat 33 C is a standard Economy Class seat in the last row of the aircraft that may have limited recline. The proximity to the lavatories and galley may be bothersome. 33 D None No Power Seat 33 D is a standard Economy Class seat in the last row of the aircraft that may have limited recline. The proximity to the lavatories and galley may be bothersome. 33 E None No Power Seat 33 E is a standard Economy Class seat in the last row of the aircraft that may have limited recline. The proximity to the lavatories and galley may be bothersome. 33 F None No Power Seat 33 F is a standard Economy Class seat in the last row of the aircraft that may have limited recline. The proximity to the lavatories and galley may be bothersome. This seat is missing a window. All seats feature a standard USB port. The Delta Airbus A320 aircraft is operated on short-haul routes. This A320 features a three class configuration with 16 First Class seats, 18 Delta Comfort + seats with up to an added 3" of seat pitch, and 126 standard Economy Class seats. 10 b is not the Comfort + seat you want. The IFE unit in the left arm rest takes part of your seat width, the tiny table in the right arm rest takes the rest, so you are shoehorned in to your seat. My IFE could not be pulled out of the arm rest, so no TV for me, and no USB. My view was of first class passenger elbows.You will share the magazine pockets, barf bag, AC port and aircraft safety brochure with one of your neighbors. Your left foot will share the space under the seat with an IFE unit. I suspect that 10 e is just as bad. Sorry excuse for extra cost Comfort +, if this is your only Comfort + seat option, choose economy, and save your money. This was seat 1D on N362NW. Leg room was a tad less than rows 2, 3, and 4 in first class, but nothing worth complaining about. Window alignment was solid. This is a review for seat 3D, on N327NW. This was one of six A320s without TVs at Delta, which was a bit disappointing. But for the seat, it was very comfortable, plenty of leg room, and nice window alignment. great for hearing the engines on takeoff. 10F is probably the best comfort plus seat. You get a first-class-size IFE, with plenty of things to keep you entertained. AC power is to the left beneath the seat, and USB to the right. The person in the middle has a fold-out screen from the tray table holder. There is plenty of legroom due to the lack of a bulkhead, more so than other Comfort+ seats, and ample room to store your backpack underneath the F seat. Best economy seat on the plane! Seat 21A on N357NW was great. The TV's on the Airbus A320's 32M configuration were amazing. The outlets were also there. Pretty decent seat for a wing view. Seat 11A is a Comfort+ seat. Legroom was amazing, seat was very comfortable, and IFE was perfect. This was flight 1395 on N352NW. This seat has 2 windows, with one located by your head and one before the seat in front of you. This seat is located near the engine, just before the front of the wing, so engine sound is great too. If you are sitting in Comfort+, sit in 11A or across in 11F. This plane is very comfortable overall. Even in a middle seat the cabin is very spacious. One of the unique things about 10E is that there is no seat-back pocket in front of you, in case that is something you care about. Being the first row of comfort plus, row 10 also has decent leg room. The seats were comfortable but I'm glad that I'm only 5'7". My knees were touching the seat in front of me. The aisle must be narrower because the flight attendants kept running into me. The bathrooms are an utter joke and I will avoid this style of plane at all costs. Imagine a bathroom only as wide as your hips and shoulders. For a female, hygiene is nearly impossible without strange acrobatics which lead to touching others bodily fluids. I'm not germaphobic but in this teeny tiny bathroom, I would be. I doubt there was any customer testing on this bathroom using people of normal body size performing actual bathroom functions. I don't even think Barbie would be able to use this bathroom. Delta should truly be ashamed for thinking this design would work. The seatback screens are off-center, which is slightly bothersome as you have to reach across your seatmate to operate the display. The seats are slightly narrower as the trays and video screen for 10E are in the armrest. This should be a green/yellow rating rather than a green. Seat 3A, RSW-ATL, this plane was clean with a new modern interior. Seats were comfortable and each had personal seat back entertainment system which worked flawlessly. Still had plenty of room when the seat in front was reclined. Did not inspect the lavatory. I would be happy to have this seat on an even longer flight. Ample legroom, but seats A and F do not recline at all, which makes no sense as there no more exit rows behind this row. Seat 13F on the A320 had stellar window alignment. For someone who cares about having a window at head side for a good view, this is absolutely the seat to choose if you are not in First Class or Comfort +, but still want to hear the buzzsaw on takeoff. Good window alignment. There is a metal bar under the seat in front right where I would normally put my right foot. My backpack fit snugly under the seat to the left of that bar and as a result there was no space to extend my left leg. If I sat at an angle I could extend both legs under the row ahead between seats A and B but it was not a comfortable position. There was good ventilation at this seat. Row 16 seats did not recline. 16A and F are particularly uncomfortable due a protruding form in the wall panel designed to place the passengers' elbows, but in this case they are misaligned. Ship is N358NW, on Nov. 5. Great seat for short haul flights like the one I was on from Austin to Atlanta. To my surprise, N344NW has ptv's. Never knew they had then instaled. Domestic First (including this flight to the Dominican Republic) is certainly not comparable to international business class but for a 3 hour flight this is a good way to go. Wide, comfortable seats and at 5'10 I didn't feel in any way that legroom was reduced at the bulkhead. There is a small restroom up front that doesn't cause a problem either. The food is good, service very friendly and it is quiet and quite spacious up front on an A320. Unfortunately no IFE on this plane so download a movie or two as I did. There is wifi but only when in US airspace, it vanished half way to the DR. I wouldn't rely on it personally, for entertainment. Hope they don't ban iPads in the future! Upgraded interiors make the cabins on these older aircraft look nice, but don't be fooled. Legroom is limited. The new overhead bins can hold more and are more efficient but they just make the space even more tight feeling when open. Extremely uncomfortable for even a two hour flight. Avoid this Aircraft - I am 5'2" and the new bathroom configuration is so uncomfortable that i would NEVER fly on the Airbus 320 or 319. Awful move on Delta's part. Yes, I was in Business class, but the restroom was full. this closet was 1/3 the size of a standard airplane lavatory. Normally the bulkhead seats behind business are spacious. When first class reclines back, it's on par with economy class spacing. I'd update this whole row (row 10) with: Curtain divider, average leg room, but cramped with business class reclined. I fly for a living and this has to be one of the worst seats I have ever sat in. I was aware of the seat not reclining due to the emergency exit row behind but the legroom was impossible. I'm only 6ft tall and had a very difficult time just getting into the seat not to mention the seat width, I'm not a big man, average to say the least, I was not able to move at all once I wedged myself into the seat. My knees were touching the back of the seat in front of me and when the person in front of me reclined back...WOW! This is a terrible coach class with literally no leg room--- im 6'5" the plane is recently renovated, plenty of overhead space fitting up to 4 bags on their side. Power oulets with usb. This layout is a cruel joke. Delta once again chooses cheap over customer. The last row doesn't have a window because Airbus probably meant for it to be a bathroom. Instead Delta made another row of seats and jammed two bathrooms in the back that are literally too small to allow you to turn around. I'm 6' and 175 lbs and am not even considered to be overweight and I could barely rotate in the bathroom to wash my hands. My daughter was sick throughout the flight because she couldn't see any windows and had no point of reference when the plane turned. This is by far the worst coach seat I've ever had to sit in. I'm 6' tall and I barely had enough legroom to move my legs at all. I could not recline my seat as the person behind me what using his laptop and due to the lack of legroom. I've never been this uncomfortable on a Delta flight. I'll not be flying this type of aircraft anymore. With the exception of the few times I have flown 1st class, this is the most legroom I have ever had. This is an exit row so that's why. Even so it's a crazy amount of legroom. It is not even necessary for the person in the aisle to get up to let the window and middle seat passengers out. Bulckhead first class seat has very little leg room. Dont pick row 1. Exit row seat, lots of legroom. No TV but that's the same for the whole plane. Worth the extra $29 I paid for it. I sat in 16F expecting it to have full recline as indicated on the seat map. I was disappointed to find that it had zero recline. It may have simply been broken but on a brand new airplane that is hard to believe. All of the other seats in my row reclined correctly. Updated interior works well and looks good. Good Wifi response, especially relative to older implementations on other Delta aircraft. 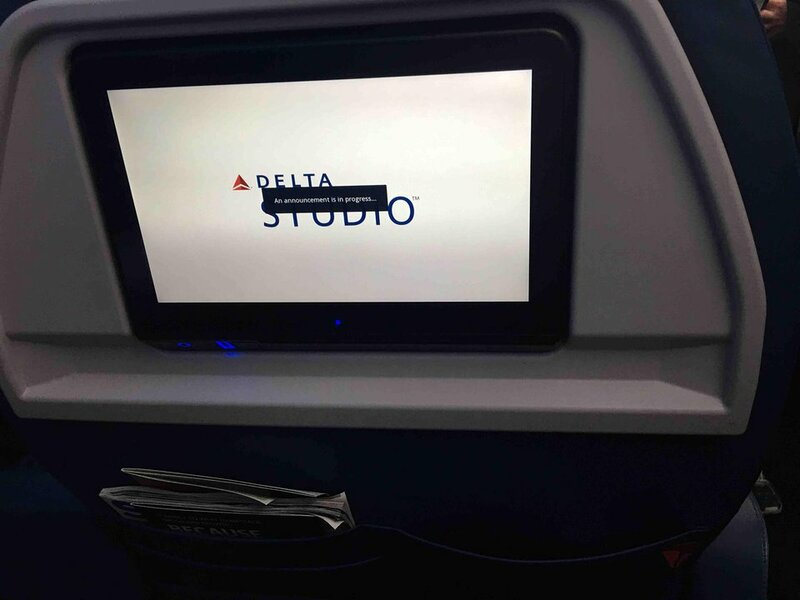 Lack of in-seat entertainment changes movie options and does not offer live-tv of other Delta aircraft. Comfortable, modern seat in first class. Cabin looked to be recently updated. Legroom was appropriate for first. The bathrooms were hysterical, a total joke! I have never laughed so hard. I am 5'4 and 125 and could barely move to shut the door or have elbow room to pull my pants up. Who would ever approve of this design! First time on the updated 320. Lighting is nice, but there is less leg room and the seat was like sitting on a wood bench. Might be ok for a short fflight but not for my flight from COS to ATL. For a first class seat very unpleasant. Legroom barely adequate. With the seat reclined in front of me, super tight quarters. Seat seemed comfortable but two hours into flight I was in pain. Interior is pretty enough but I will avoid Delta A320 in the future. The overall new look is nice with updated modern lighting. The controls for lights and call button are smaller and harder to see- pax in front of us kept hitting her call button accidently. The economy comfort seats are nice with more leg room and cushier head rests. Biggest improvement: the spacious overhead bins allow for more bags but one in our area was broken causing a 50 min delay! The bathrooms are terrible! SO small, not sure how anyone even slightly overweight could fit in there. Its like they took one of the old ones and split it into two. They're crammed in the galley area which was a nightmare when in line for the lav and attendants readying carts. This needs to be redesigned again! The new cabin is horrible. There is less leg room and the seats are the most uncomfortable I have had in many years. There was no way to get comfortable in them. It is too bad because the old seats were actually pretty good. The seats also don't recline much if at all. Hated it. Legroom at this bulkhead seat is one of the worst I have ever had. Normally I always book a bulkhead, but not on this plane. A320(OW) again. Super comfy seat, especially after three legs with the 737-900 plastic nightmares. Legroom was like the days of yore when you could sit in a window seat, actually store your backpack under the seat in front of you, and still not eat your kneecaps. The seats are high enough off the ground and the supports are in the right place once again so carry on luggage can actually be stowed safely. The ultra-modern redesign makes it an attractive plane as well. Totally agree with the comments about how small the bathroom is, however. I had to use the handle to pull myself upright again. I agree with the comment that the lavatory was impossibly small. An even bigger issues is the cramping in the standard economy seating. They have made it so tight that the attendants were begging people not to recline so they would have room to place drinks on tray tables. Half the people put up the aisle armrests hand slid out to relieve pressure on the rows. I am of average height and there were no large people in my row and it was very tight. If you aren't in a higher class of service, this configuration for the A320 is uniquely uncomfortable. The refurbished cabin was gorgeous and my seat was comfy, but WHOAH those restrooms are impossibly tiny! While I'm moderately fat I'm usually fine in airplane bathrooms, but I could barely turn around in this one. It would be impossible for many people with disabilities to use this bathroom. It was so cramped it made me angry. It was the smallest airplane restroom I've ever seen. Delta should be ashamed. 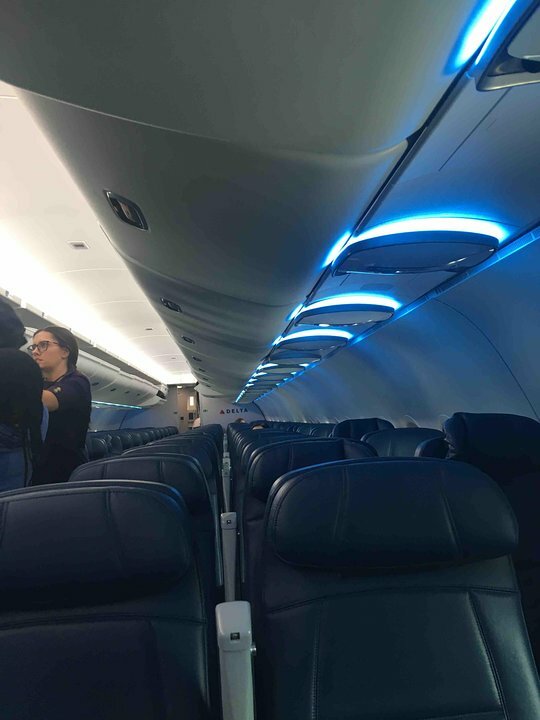 Delta's newly refurbished A320 is absolutely first rate! The first class seats are extremely comfortable, have ample recline (unlike the new 737-900ER), and the cabin interiors have been redone with new futuristic lighting and very spacious overhead bins. People will love this newly refurbished version of the A320. The cabin has all new carry on bins with deep storage for possibly double the number of carry on bags compared to the old version. The cabin lighting is very futuristic and well thought out. Finally, the first class seats are extremely comfortable and unlike the new 737-900's, have ample recline. Coach looks to be just as nice. I think people will really enjoy this new Delta product. Delta flies 2 versions of Airbus A320.